I’m a video pinball junkie so whenever I see a pinball game that I haven’t played before, I have to grab it. I don’t expect much out of a 16-bit pinball game, but this one isn’t half bad. The presentation and menu system are terrible, but once you get into the game itself, it provides a pretty realistic pinball experience. The ball physics feel accurate, which is a must for a proper pinball sim. 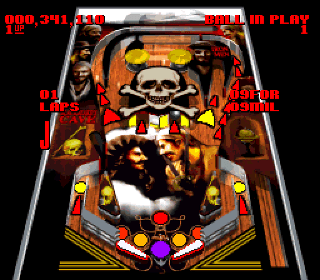 Super Pinball comes with three tables; “Jolly Joker”, “Blackbeard and Ironmen”, and “Wizard”. The tables have the complexity of a machine from the 70’s, but there’s nothing wrong with keeping it simple. Jolly Joker has a picture of a creepy clown right in the middle of the table, but otherwise doesn’t have much of a theme going. Blackbeard and Ironmen is the nicest and most thematic looking table, with the realistic wood effect trying to mimic the look of an old pirate ship. The Wizard table doesn’t have much to do with wizards, and is easily the ugliest of the three. The tables’ themes are secondary to the varying layouts, but more cohesive themes would have added to the game’s ambiance. The game has no configurable options, which is an annoyance because I would really like to turn off the background music. There’s also no pause menu, so if you want to exit out of the table you’re playing, you have to reset your SNES. Super Pinball is a more than passable pinball game that just doesn’t go the extra mile to make itself great. If you like playing video pinball, Super Pinball is definitely worth checking out, but if you aren’t a fan of the genre then there’s probably nothing here that’s going to persuade you to reconsider. Buy Super Pinball: Behind the Mask on GameGavel or Amazon. Tagged Arcade, Behind the Mask, Pinball, Review, SNES, Super Nintendo, Super Pinball. Bookmark the permalink.